Set in Barresh in contemporary times, about 100 years before the Ambassador series, this is a group of four standalone novels that feature characters that are about to strike out on their own. The books are full of adventure, strange worlds and relationships across cultures. 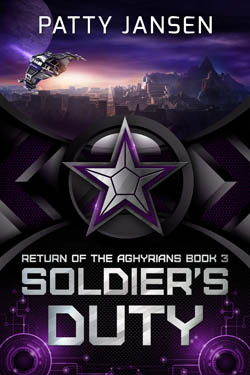 Izramith Ezmi is many things: a member of the feared, all-female Hedron guards, a war veteran recently returned from a pointless and bloody mission, and impatient, angry and above all, lonely. With her contract about to run out, she may be on her way to becoming a ruthless mercenary, since what she really wants–becoming a mother–is out of the question. Her family carries a gene that causes deeply malicious madness. Her nephew was born with it and her useless sister has left him in the care of an institute. A baby. Two days old. She wants to ask her uncle, himself born with the condition, if he can do anything for the boy. But her uncle and his band of mad outcasts have gone missing, rumoured to be on the world of Ceren. So Izramith takes another hired-gun contract in Barresh which is a city-state on Ceren. The job is to provide security at a high-profile wedding. Simple and straight-forward, right? No crawling in mud, no shoot-outs, no mangled bodies and blood-drenched soil. And meanwhile, she can try to find her uncle. Except he isn’t there, and the job isn’t simple. Izramith and her team discover evidence of an extensive spying ring that threatens the entire city. Postponing the wedding would be an admission of defeat, so it’s time for desperate measures. Izramith leads a small team in what has to go down as the most hare-brained mission to ever be undertaken in the universe. Much is at stake: peace, the lives of her uncle and her nephew, and her own. If Miran had princesses, Ellisandra Takumar would be one. Smart, pretty, engaged to a high-profile man, everything a high-class Mirani woman should be. But things are not well in Miran. Many years of boycotts have taken their toll on society, and the regime becomes more desperate to keep its citizens under control. Revolt is brewing. As director of the state theatre, Ellisandra has been asked to stage a violent traditional play which stands stiff with threatening political messages for the populace. She hates it, but speaking out would risk that she’d be cast out from the only world she’s ever known. Next to her house is the burnt ruin of the house of another high-class family, the Andrahar family. They fled Miran for political reasons when Ellisandra was a little girl and the house has lain untouched ever since. One night, she spots a mysterious young man walking around the yard, putting out pegs and pieces of string. He’s re-building the house. That makes no sense, because the family is no longer welcome in Miran, and who is he anyway? She is curious and investigates. He seems too good-natured and naïve for his own good, so rather than telling her brothers, she tries to shield him from her own society. And so starts the slide that leads to her being cast out from the only life she’s ever known. A space opera series that spans four self-contained stories that add up to a larger tale. 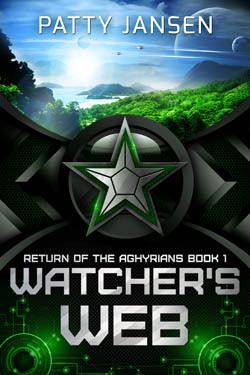 In Watcher’s Web, Jessica is lost on an alien world after a plane crash, or that’s what she thinks. In her efforts to return home, she discovers a horrible truth about herself. Two men are overly keen to help her, but which of them speaks the truth? 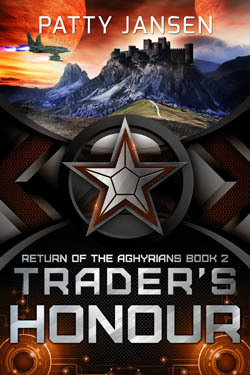 In Trader’s Honour, Mikandra has just been accepted as apprentice with an influential Trading family when she sees her life’s dream evaporate from under her. Going to Barresh to locate the family’s missing money sounds simple enough, but she uncovers layers of betrayal by people she trusted. In Soldier’s Duty jaded soldier Izramith accepts a contract providing security for a an event in Barresh. Privately, she is looking for her uncle who disappeared in the neighbouring nation of Miran. He was not the only one; people like him have been disappearing for years. Attempting to free them from the heart of Miran makes her undertake the most hare-brained operation of all her military career. 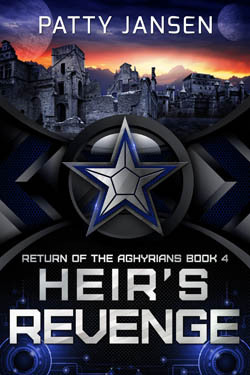 In Heir’s Revenge the task of facing the tyrant of Miran is left to the least likely person of all: Ellisandra, a genteel young lady whose normal job it is to run the Mirani state theatre. She has no guns. Her weapons are words and a single public performance of a classic play.